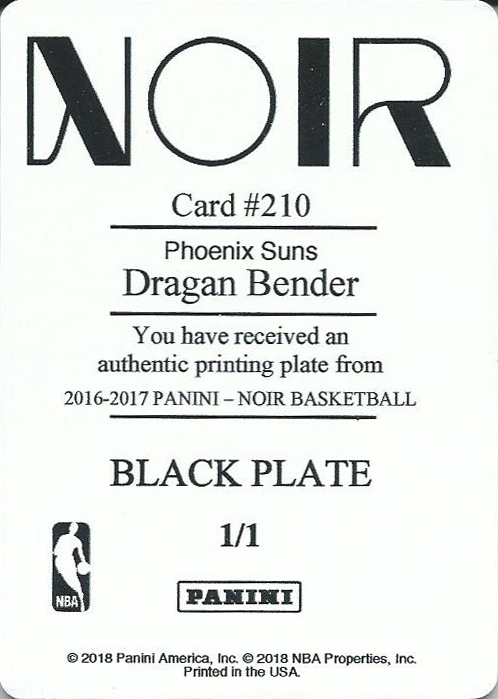 I picked up this 2016-17 Panini Noir Dragan Bender printing plate for my Suns collection and I was expecting a standard printing plate but it turns out that Panini used the same thickness as the base cards, roughly about 100 pt. 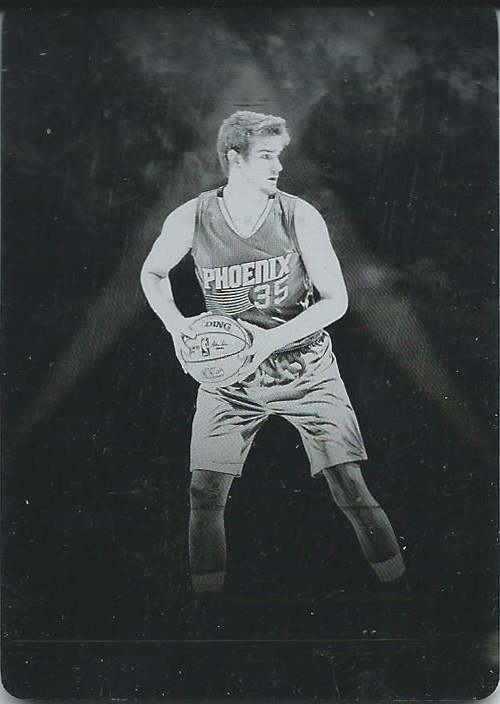 I am confused as to why these printing plates were packed out in boxes of 2017-18 Panini National Treasure Basketball. I didn’t know this until I went looking in to why the Noir checklist didn’t include printing plates. A quick recap about my 2015-16 Gala Cinematic Signatures Crimson Steve Kerr card. Last October I purchased a redemption for the card and submitted it. 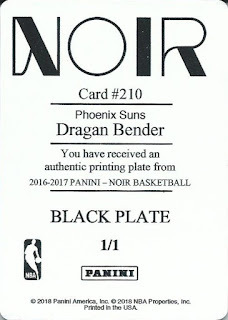 The card was live at the time and I was expecting a quick turnaround, but I ended up watching the card sit in card limbo for 6 months before I contacted a Panini CSR. 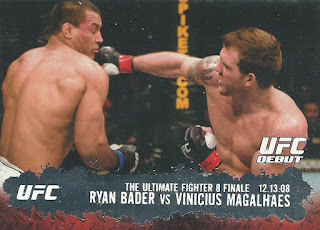 Two weeks later the card shipped, and I planned on posting here when I got the card, which was received on March 30th. I was elated to finally have the card in my hands but when I pulled it out from the packaging I noticed something disturbing on the back. There were two large blemishes, I wasn’t sure if they were on the case or the card, so I started to go through the options at this point and the card got set aside. 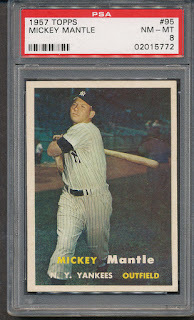 My options, as I saw them, were to leave the card in the case as is and ignore the blemishes. 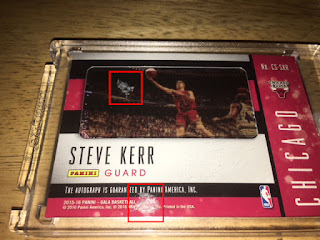 Send the card back to Panini and have them replace the card or case (whichever was damaged) or take my chances and open the case and see where the blemishes were located. If I left the card in the case and it was something like broken plastic pushing against the card it would damage the card and if I ever sold the card, not that I ever planned to do that, it would have to be at a reduced price. If I sent it back to Panini to replace the card or case, I may never see the card ever again. Finally, if I open the case and the damage is to the card I am screwed because Panini wouldn’t replace it since I removed it from the case. Today I finally decided to remove the card from the case and take my chances. It turns out that it was plastic caught between the card and the case. It wasn’t like a broken case type of jagged plastic, but it was solid. Fortunately, the pieces did no damage to the card though there are some marks on the inside the case from where the pieces were sitting. I feel like I made the right decision and things turned out fine. 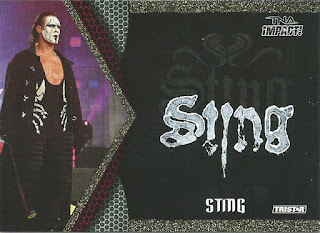 While I have been a fan of wrestling going back in to the 1980s I was never a fan of Sting. I didn’t have anything against him I just didn’t know much about him until I started watching WCW Wrestling in the late 1990s but after that point I'm a fan. When the WWF (WWE) bought out WCW in 2001 several of WCW’s top wrestlers moved over to TNA including Hulk Hogan, Ric Flair, Kurt Angle and Sting. 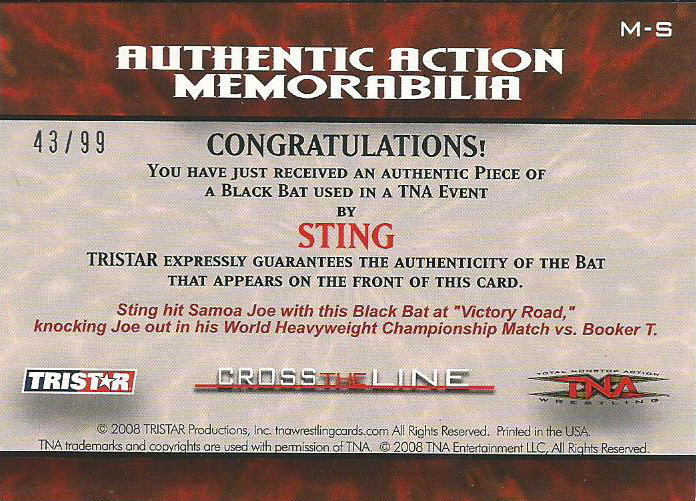 During the TNA Impact years TriStar had the exclusive license of the brand and I think they did an amazing job, I had talked about their products a number of times during the early years of my blog. 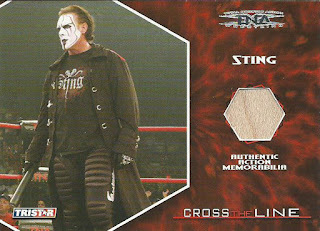 One night a few weeks ago I was doing a search of some wrestling cards and eventually ended up looking at Sting’s cards and was immediately drawn to this 2009 TNA Impact Sting Face Paint card. 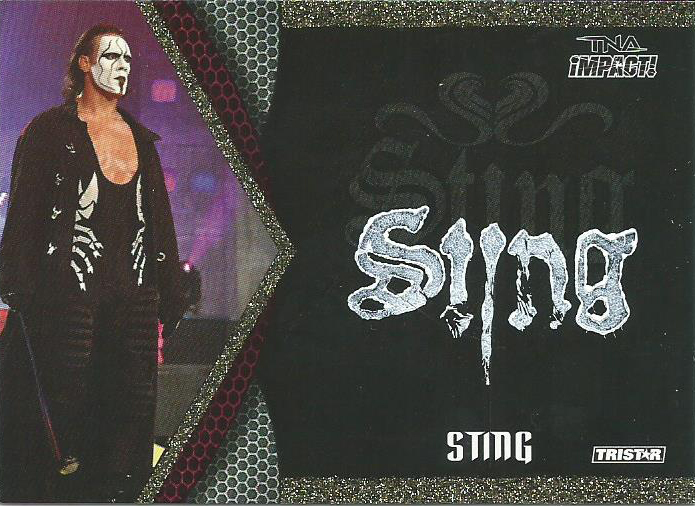 Tristar used Sting’s face paint to spell out his name on the card front. It isn’t actually wrestling used paint but I am guessing from a can of the face paint his uses. I had tweeted about it after I won it because the price was extremely low and after I bought the card the seller put it back up for auction. I was worried because the price was well under the going price and the seller was new, so I feared he changed his mind and was going to cancel my purchase. I emailed him and he assured me it was relisted by accident and that he would be sending the card. About a day or two later, while still stuck on Sting cards, I found this baseball bat relic card from the 2008 TNA Cross The Line release. 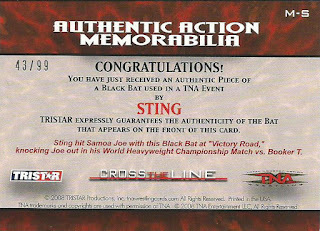 If you are not familiar with Sting’s character, he would often carry a black baseball bat during his later WCW and TNA career which he would occasionally use as a weapon. You wouldn’t expect a bat in a wrestling release, but here you go. 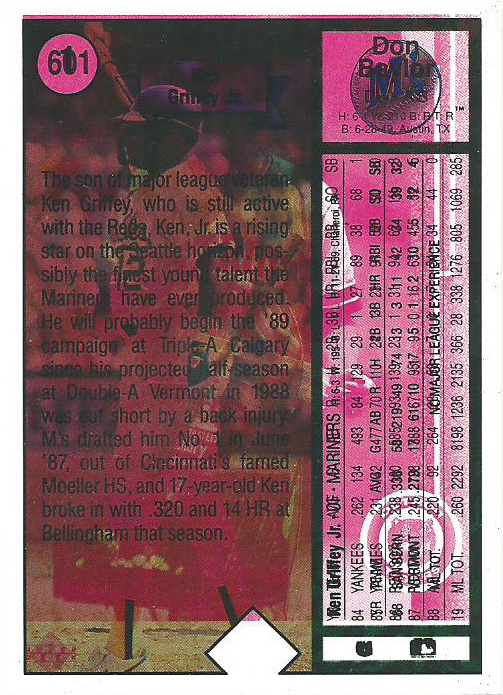 Donruss was well known for their detailed information about the relics that they used in cards, including images of the specific item too. Tristar’s guarantee takes it one step further not only saying when the bat was used, but how. Sting struck Samoa Joe with the bat at the Victory Road pay-per-view during Samoa Joe’s bout against Booker T.
Monday Question Day- Is The Dude Really There? Is it me or does it look like Topps attempted to airbrush out the guy behind Mickey Mantle in this 1957 Topps card? I guess this would be my Laurel / Yanny moment. I have looked closely at the image in Photoshop and either it was a really bad choice of clothing that day for the guy that matched the background or Topps wanted only Mickey showing. Daniel from It’s Like Having My Own Card Shop is holding a contest to celebrate his 9th Blogiversary. To enter is simple, post 9 cards. I chose to go with showing 9 of my favorite rookie cards in my collection of 9 people I collect. 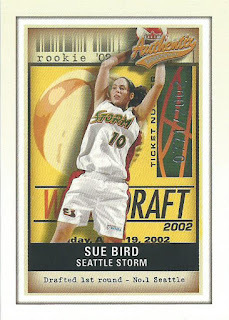 When I picked up Sue Bird’s 2002 Fleer Authentix rookie card I did not realize that I had completed a Sue Bird trifecta. Even though I only have 11 Sue Bird cards, according to TCDB she has 164, I do consider this a mini-PC and I plan to continue building on the collection. 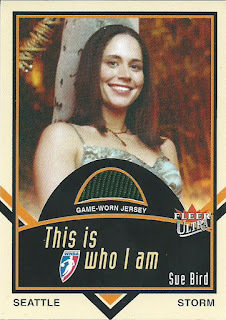 Girffey’s cards with low serial numbers are quite costly but I have found the perfect option, go with a modern Leaf card. 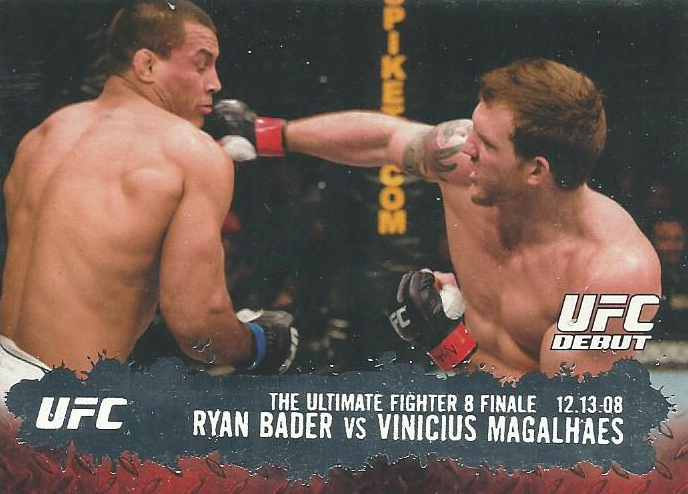 Over the last few years Leaf has put out some pretty amazing cards but many times people by-pass them because they are unlicensed. I am not too caught up in unlicensed cards, as long as I like the card’s design and that is the case with this 2017 Leaf History of Baseball 1991 Acetate Throwback. There are 5 cards; a base and four parallels. The base is charcoal and unnumbered with the four parallels being Blue (#/35), Purple (#/25), Green (#/10) and Red (#/5). This one is the red and mine is #1/5. 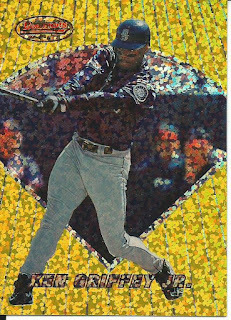 I also have the base, Purple and Green which I thought I had posted in one of my previous Griffey Cavalcades but I can not find now. 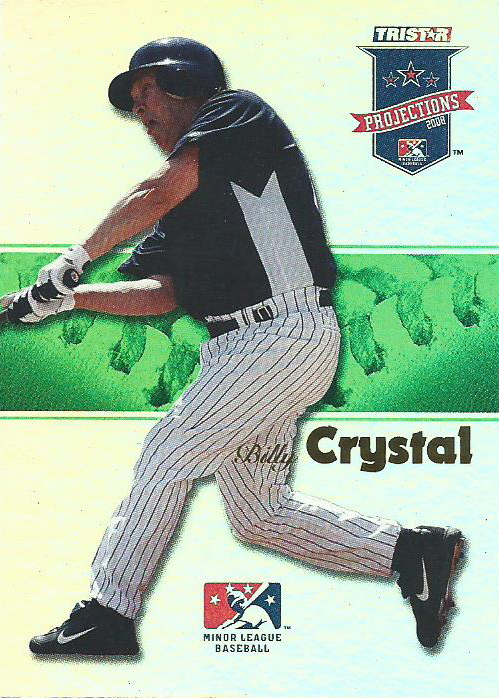 Labels: 1991 Acetate Throwbacks, 2017 Leaf History of Baseball, Ken Griffey Jr.
Monday Question Day- Sports Dynasties? Which sports dynasty were you happy to see happen? Mine was the NY Islanders. 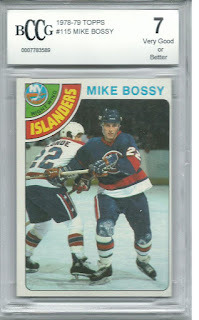 The Islanders were the first sports team I followed, I was born on Long Island in the same year the Islanders were an expansion team, and my dad used to take me and my brothers to games at the Nassau Coliseum. They won four Stanley Cups between 1979-1983 and it was exciting as a kid to see that happen. 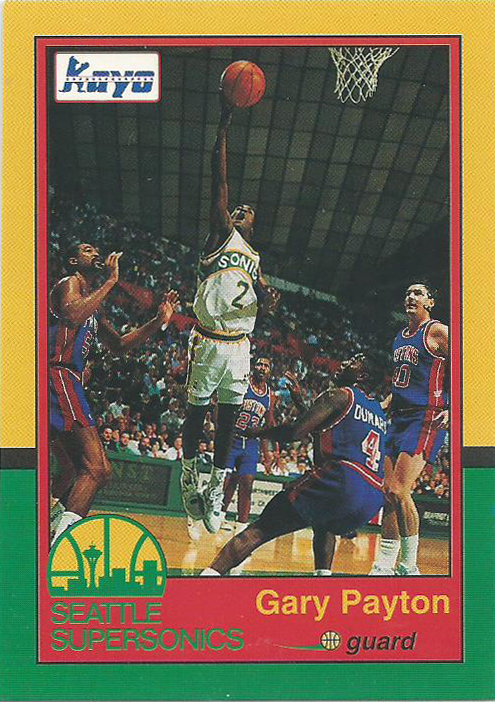 Additional question: Which sports dynasty were you unhappy to see happen? 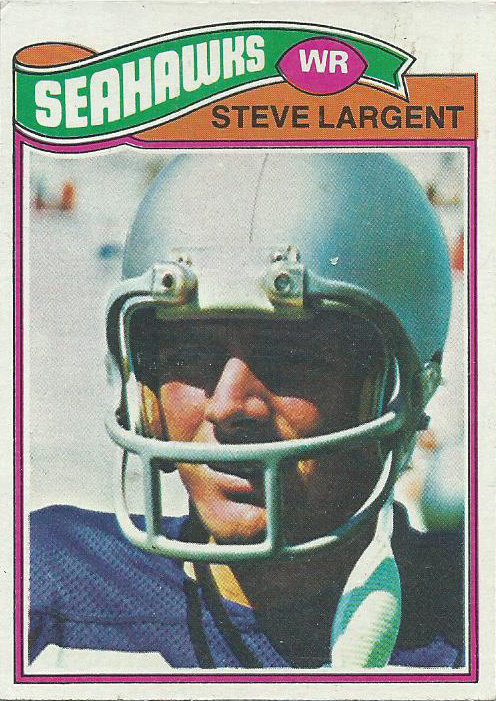 The Dallas Cowboys after Jerry Jones took over, current New England Patriots and anything connected to the New York Yankees with Alex Rodriguez on the roster. 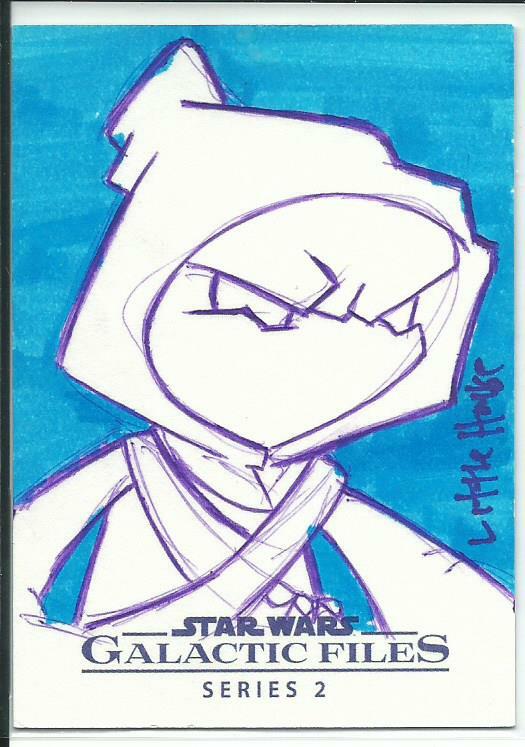 This month’s Art Gallery display comes from an interesting artist, he does his work under the name Little House but his real name is Edgar Pasten and is a Jawa from the 2013 Topps Star Wars Galactic Files Series 2. Pasten uses a very cool cartoonish style with his cards and that works so well in the Mars Attacks and Star Wars sets in which his sketches are included. 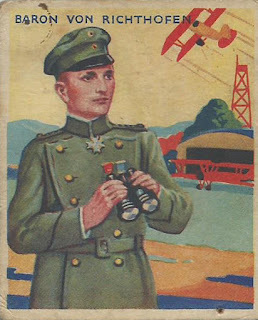 What makes him interesting is that he uses a very unique color theory with his sketches, his work is almost always in one color per card. In this case he worked in blues but I have seen reds, pinks, purples and greens in others. I like the Jawas and Sandpeople, I don’t think I have any specific reason why I like them, maybe because they are the first alien creatures we see in Star Wars and that made an impression on a young Corky when I saw the movie in theaters, not sure. But I do love the cartoonish look and the blue works so well here so this makes a wonderful addition to my Star Wars collection. A one card Griffey post, a 1996 Bowman’s Best Preview Atomic Refractor that I picked up last August. 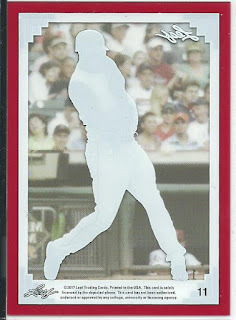 I was never lucky enough to pull any type of Griffey refractor, let alone an Atomic refractor and normally I don’t check prices on the mid-90s refractors because they are usually outside of my price range but this was just a case of checking at the right time and I got a great deal. 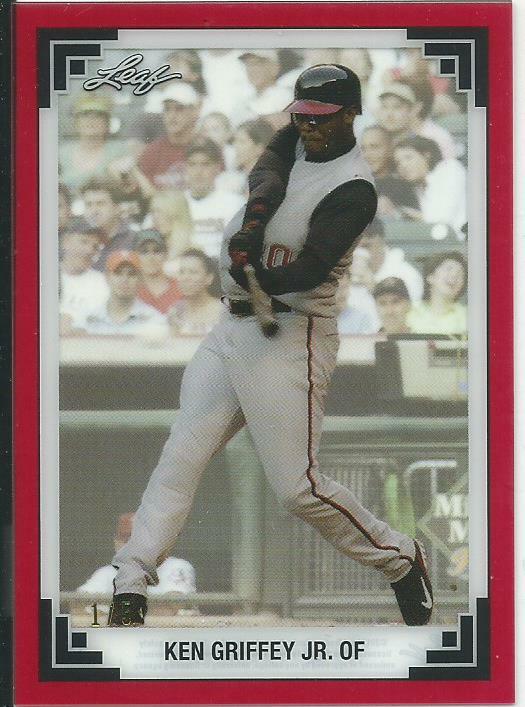 Labels: 1996 Bowman’s Best Preview, Atomic Refractor, Ken Griffey Jr.
Monday Question Day- Bankruptcy Cards? How do you feel about cards that made it to the streets as part of a company bankruptcy? 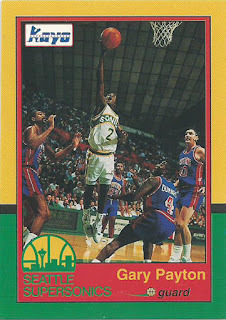 I want to make it clear that I am talking about cards that were legally sold as part of a bankruptcy/buy-out and not cards walking out the back door. I picked up this 2003-04 Fleer Mystique Allen Iverson gold parallel on eBay not long ago that was part of Fleer’s bankruptcy vault clearance. 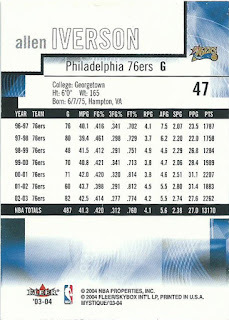 The card is the same as the packed-out versions except for missing the serial numbering on the back (#/150). 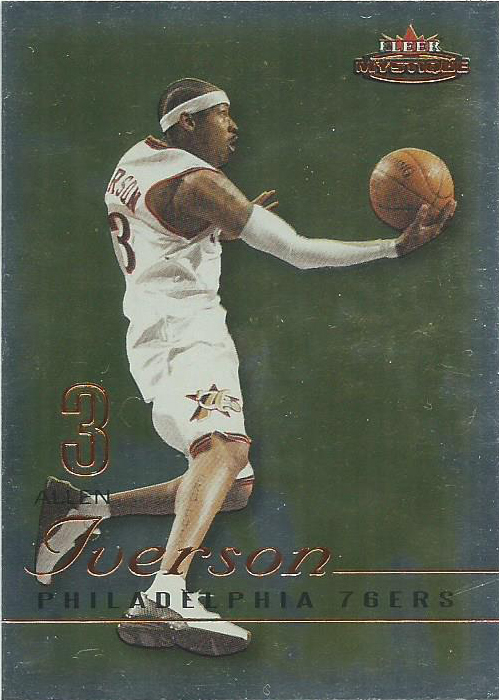 I think it is a cool addition to my Iverson collection, so I am happy to have it, I see it as a bit of an error of sorts, but I know that there are people out there who are against this type of card being sold. 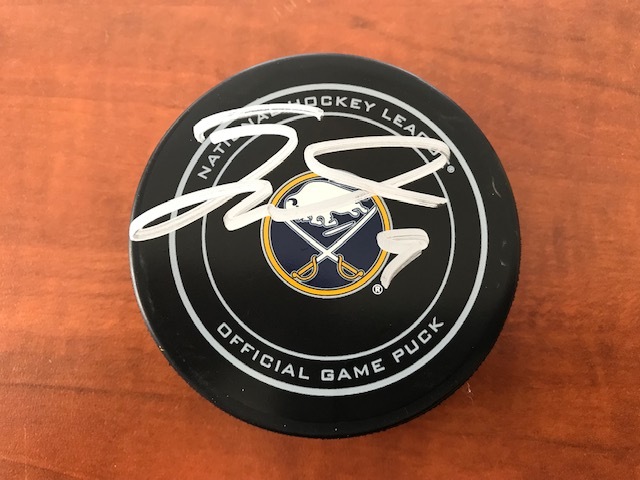 Here is the link for the auction, it shows the back. I have had this 2008 TriStar PROjects Billy Crystal #400 on my wants list for awhile I have been holding out for one of the official autographed copies to show up but when they do they end up going for a high price so I made the decision to grab this card, which is a Green Refractor parallel andd is #32/50. 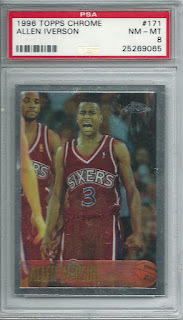 The card has been sitting on eBay for months, lowering in price every so often until it was finally in my price range. 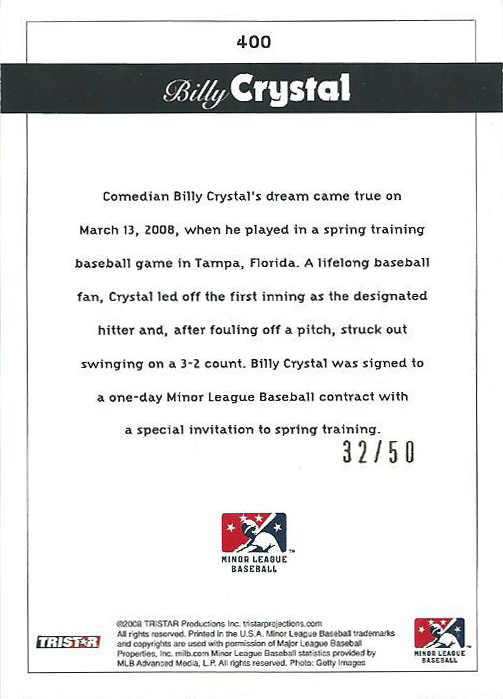 Billy Crystal is accommodating when signing and is a huge Yankees’ fan, so he signs baseballs all the time, maybe I will pick up one of the signed baseballs for my collection. Last night turned out to be productive for me. I made it about 1/3 of the way through my non-sports collection and that includes organizing three sets and listing my needs to complete the sets. I was able to get themes together (Simpsons, Star Wars, etc.) in one box and separated so when I collate those sets it is all together instead of me having to go through a bunch of different boxes and binders. 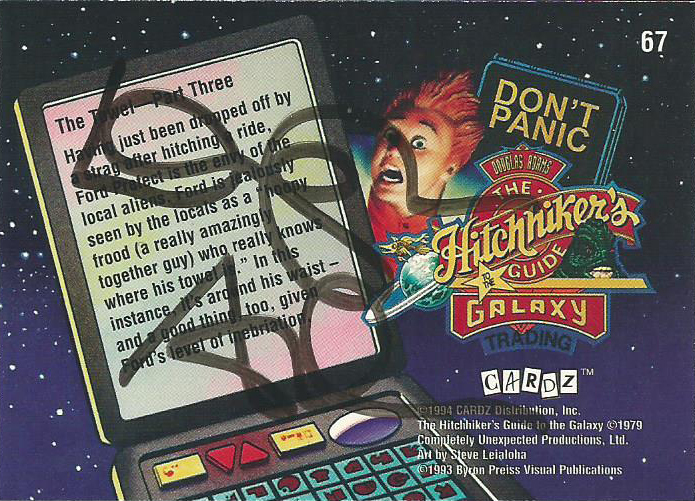 The best thing to happen was when I was collating the 1994 Cardz The Hitchhiker's Guide to the Galaxy cards. I bought the box a couple of years ago, ripped the pack and then put all the cards back in to the box. Last night as I was separating the cards I found out I had pulled a Douglas Adams autograph and didn’t even notice it because he signed the back of the cards, not the fronts. I posted about it on Twitter last night, this is easily one of my favorite found treasures ever. I get my second round of cortisone injections in my hips tomorrow so today I figured I would get in some time working organizing my non-sports collection. First up for sorting? 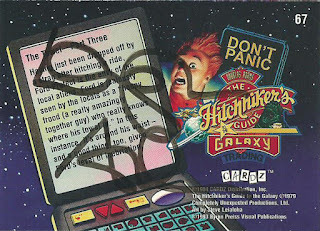 A box of 1994 Cardz Hitchhikers Guide to the Galaxy. 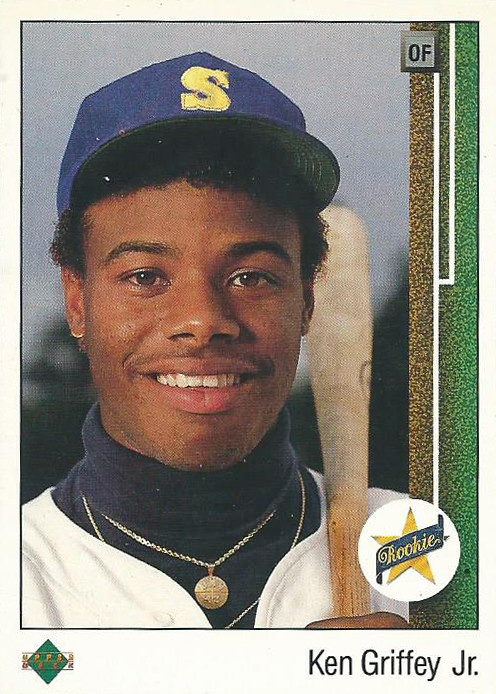 Another of Griffey’s 1989 Upper Deck error cards makes its way in to my collection. 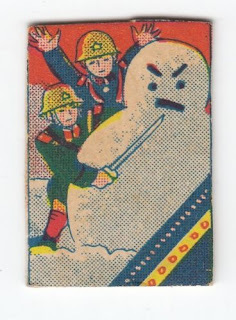 This time it is a blank front and triple print error with a twist. 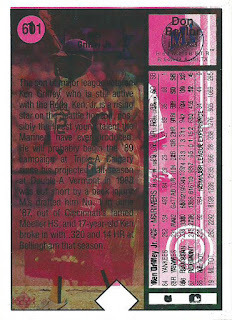 The back of the card is the Griffey #1 back and the Don Baylor #601 back, which is the most common double print back. 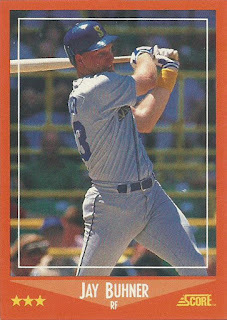 The third misprint is the addition of Alan Trammell #290 front and the twist is a misfire of the Magenta Trammell front adding the pinkish color and this is the first time I’ve seen this much of a color bomb with a 1989 Upper Deck error. Labels: Error Card, Ken Griffey Jr.